2. the IgG class of immunoglobulin that combines specifically with an atopic allergen but does not elicit a type I allergic reaction, the combined IgG antibody "blocking" available IgE class (reaginic) antibody activity. 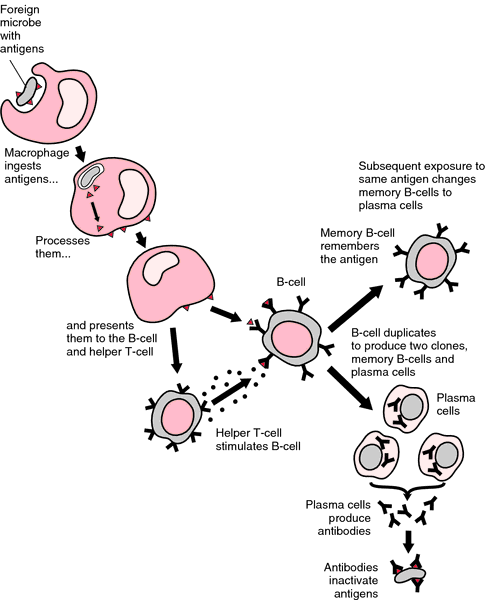 an antibody that reacts with an antigen but fails to cross-link with other antigens and cause agglutination. When such antibodies are present in high concentration, they interfere with the action of other antibodies by occupying all the antigenic sites. See also antigen-antibody reaction, hapten. An antibody which competes with another for an antigenic binding site. Blocking antibodies (Bas) may appear in malignancies, preventing a tumour’s destruction by cytotoxic T cells. A protective venom- or allergen-specific IgG present in high titers in those exposed to anaphylaxis-producing substances; the IgG successfully competes with IgE, blocking the allergenic epitope, preventing mast cell degranulation and a hypersensitivity reaction. 1. Antibody that, in certain concentrations, does not cause precipitation after combining with specific antigen, and that, in this combined state, "blocks" activity of additional antibody added to increase the concentration to a level at which precipitation would ordinarily occur. 1. interruption of an afferent nerve pathway (see block). 2. inhibition of an intracellular biosynthetic process; metabolic block. see under alpha, adrenergic, blockade, blocker, ganglionic, muscarinic. Nivolumab, a programmed death receptor-1 (PD-1) blocking antibody, has been approved as a single agent for the first-line treatment of patients with BRAF V600 wild-type unresectable or metastatic melanoma, the manufacturer has announced. We are on target to complete Phase I studies of IMC-1121B on several administration schedules in the first half of 2007 and intend to focus significant efforts on developing this promising VEGFr-2 blocking antibody," said Eric Rowinsky, M.
According to the Database Safety Monitoring Board (DSMB), the company's IMP321 (Two ACTive Immunotherapeutics in melanoma) is safe and well tolerated at the first dose level when used in combination with a PD-1 blocking antibody and dose escalation can continue as planned. The efficiency of this HAMA blocking antibody in CARDIAC T Quantitative has been repeatedly tested with heparinized blood samples where plasma was exchanged by two commercial HAMA sera (cat. and his colleagues were the first to show that tumor cells secreted VPF and that a blocking antibody to VPF could prevent the devastating edema and fluid accumulation characteristic of ovarian, breast, and many other human cancers.